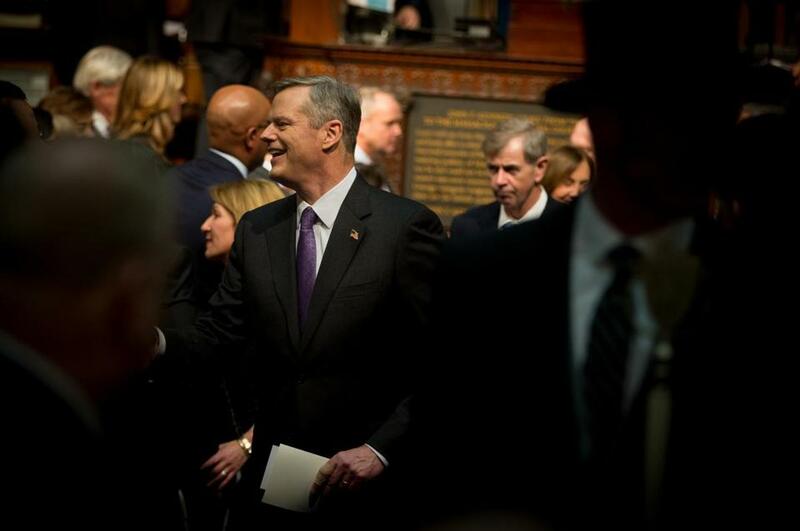 Massachusetts Governor Charlie Baker greeted members of the Legislature as he walked through the chambers of the State House. Charlie Baker, whose Mr. Fix-It persona has made him one of the most popular governors in the country, vowed Thursday to remain committed to the “blocking and tackling of government” in his first State of the Commonwealth speech. Acknowledging that “some have lamented how boring we are,” he did not make any splashy new proposals in the high-profile address, opting instead for tweaks to the machinery of state. The Republican governor called for $75 million for vocational schools and for scaling back Massachusetts’ controversial film tax credit, which he tried but failed to eliminate last year. He also urged the Legislature to move on many of the issues he emphasized during his first 12 months in office: expanding the use of hydropower, raising the cap on charter schools, and curbing the deadly cycle of opioid abuse in Massachusetts. Governor Baker vowed to remain committed to the “blocking and tackling of government” in his first State of the Commonwealth speech Thursday. In doing so, he underscored a key tenet of his governing philosophy: that tending to the nuts and bolts has the biggest impact on people’s lives. “I had a basketball coach in high school who was fond of saying: Don’t confuse effort with results. Work hard, but work smart,” Baker said. Baker did touch on a few controversial matters, including his failed effort last year to eliminate the state’s film tax credit. But Baker proposed a fairly substantial trim Thursday, calling for a $7 million cap on credits available for any single production, and an end to a provision allowing media companies to cash in credits they don’t use. The administration estimates the changes would save about $43 million annually. The governor wants to pour the money into tax credits for affordable housing and an expansion of tax incentives for companies locating or expanding in Massachusetts. Manufacturers, mutual funds, and defense contractors already benefit from the incentives. DeLeo, talking to reporters after the speech, said he wanted to review the governor’s film tax credit proposal before taking a position, but offered a defense of the current program. Baker also doubled down on one of his most controversial proposals: limiting initial opioid prescriptions to a few days’ supply. “Prescribers in Massachusetts — and across this country — are far too casual about the addictive consequences of these medications,” he said. The speech comes amid mounting concern about the state budget. Outside analysts are projecting a budget shortfall as large as $1 billion for the fiscal year that begins in July. But Baker said his budget will increase funding for education and aid to cities and towns, and deposit money in the state’s rainy day fund. The speech marked the start of a transitional phase for the governor, who was forced to spend much of the early part of his term dealing with emergency fixes and crisis management. Between the monster 2015 snowstorms, a public transit system that stopped running, a massive budget gap, and the troubled Department of Children and Families, Baker had plenty of reacting to do. But the governor, absent any major new emergencies, appears to now have the breathing room to pursue a more planned agenda in a more orderly way. Whether the address will mark a turning point in his more than yearlong honeymoon with the Legislature and Bay State residents, who gave him record-high marks in recent polls, is an open question. One point of contention is whether and how to expand the number of charter schools, which use tax dollars from local school districts but operate with state, not district, supervision. Baker made an impassioned plea for lifting a cap on charters and helping some of the state’s most disadvantaged students. But that proposal faces stiff opposition from teachers unions and an uphill battle in the Senate. Another potential point of conflict: the debate over raising taxes to fund government programs. Liberal advocacy groups are increasingly vocal in their push for more revenue to fund efforts such as expanded early education and repairs to transportation infrastructure. But Baker has repeatedly vowed not to raise taxes or fees. “The governor has to thread the needle because there are clearly things the public wants more money spent on, like transportation, public safety, and education,” said Democratic strategist Michael Goldman, an adviser to Mayor Martin J. Walsh of Boston and Attorney General Maura Healey. Baker and House Speaker DeLeo, a Winthrop Democrat who has generally joined the governor’s call for fiscal restraint, could face mounting opposition from the more liberal state Senate, led by Amherst Democrat Stanley C. Rosenberg, who has repeatedly floated the idea of more revenue. 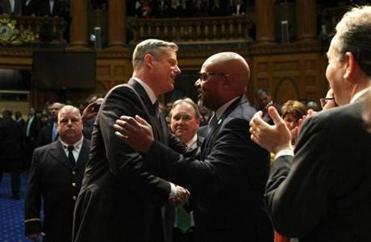 But for Thursday night, anyway, Baker focused on his largely harmonious relationship with the Legislature. at joshua.miller@globe.com. David Scharfenberg can be reached at david.scharfenberg @globe.com.